The Purple Pitcher Plant, or Sarracenia purpurea, is a part-time carnivore that supplements its diet by dissolving and absorbing nutrients from the bodies of insects that drown within the pools of its cone-shaped leaves. Since they generally grow in rather poor, boggy soil with low nitrogen content, this “predatory” adaptation has allowed the Purple Pitcher to maximize its available resources in a way that is rather unique in the world of plants. The specimen pictured above was discovered in a swamp in Northern Connecticut, which will come as a surprise to those that may have been under the impression that carnivorous plants in the Northeastern United States could only be found on the shelves of greenhouses. Indeed, wild specimens like this one aren’t a common find in Connecticut these days, owing largely to the fact that they thrive only in very particular habitats. Many of the swamps and bogs that Purple Pitcher Plants once inhabited were filled in long ago to produce viable land for development… other swamps, following a natural progression of change, have simply disappeared beneath meadows (and eventually forests) as soil and sediment deposition steadily filled in the depressions in the Earth. The result is that few people realize these carnivorous wonders live in Connecticut, at all; even fewer could imagine that colonies may live only miles from their home! 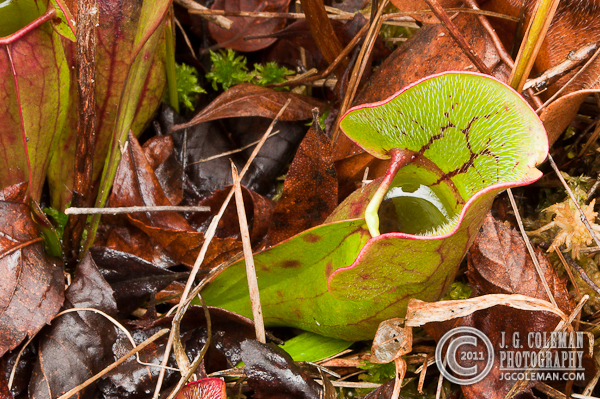 Photograph of Purple Pitcher Plant © 2011 J.G. Coleman Photography. View more photography by Trails of Freedom Chief Researcher, Justin Coleman, at J. G. Coleman Photography.